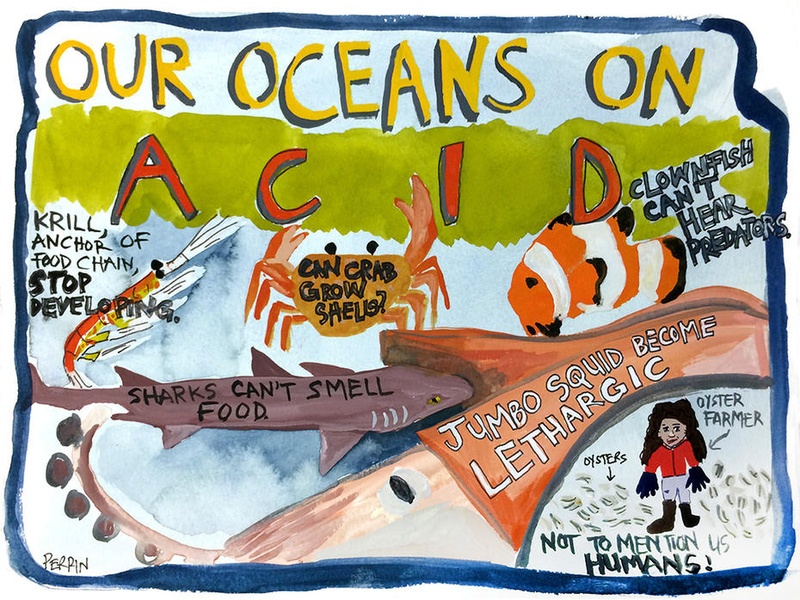 We have been told that –a possible 30% change in ‘acidity’ means – ‘coral reefs would crumble, crabs and molluscs would be unable to build their protective shells, the ocean food chain would collapse, and therefore the global food chain would fall apart’. http://folk.uio.no/tomvs/esef/esef4.htm & discover that nature surprisingly has it all sorted (without our help). The system has good feedback controls, is & always will be in equilibrium. Ocean acidification is an alarmist claim that has been easily manipulated because most people lack even a basic understanding of the acid/alkaline scale. Short lasting local areas of reduced pH (for a variety of reasons) YES…. Ocean Acidification NO. ‘Are oceans becoming more acidic and is this a threat to marine life?’ By Dr J Floor Anthoni . 30% rise in acidity !? A solution of pH1 has 100,000,000,000,000 times more hydrogen ions (acidity) than a solution of pH14. If I had a solution at pH of 8.5 the hydrogen ion content would be 3.2 x 10exp(-9) M. A 30% increase in hydrogen ion content is 4.2 x10exp(-9)M. Converting this to pH becomes… wait for this… 8.4!!!!! It doesn’t sound half as threatening as 30% does it?! It is really torturing the language to refer to a small change in pH which is above 7 and hence basic, as ‘acidification’. Pure water does respond to dissolved CO2 with lowered pH as carbonic acid forms. However, seawater is a complex buffer and dissolved CO2 is going to have very little effect on this buffer system. Even a doubling of CO2 would cause an almost undetectable change in pH. Don’t forget that photosynthesis (by aquatic plants, planktonic algae & phytoplankton) is an alkalizing process that can raise the local pH two or three whole pH units on a sunny day. Pretending that life will be endangered by small changes in pH is simply alarmism. Ocean pH remains entirely inside the historical pH range. There is a huge organic component to this process as well. We escaped the fate of Venus, largely because marine organisms used the original CO2 to create calcium carbonate, hence limestone, which is so abundant round the world, it is the earth’s major store of CO2. We have an unbroken chain of life that has survived since the beginning certainly 1.5 (& maybe 2) billion years ago. Invertebrate carbonate shell clad species – mollusca, are common in the fossil record stretching back to the Cambrian half a billion years ago. Most of these are easily recognizable as related to modern varieties. Over this time, earth has fluctuated from freezing ice ages with ice at the equator to ages with no polar ice & CO2 has varied between 150 -4,000 ppm (ten times or more the present level). Sea water is an ionic solution, dissolved CO2 continues reacting to form bicarbonate ions, which increase the pH so maintaining the pH balance, and this bicarbonate ion is used by animals to form shell and skeletal frameworks. Without this further reaction corals would not grow. So the take-up of CO2 depends on planktonic life, the more active this life the more bicarbonate is used then the faster the CO2>bicarb reaction continues. Dissolved CO2 remaining in the water is used by planktonic and other plants to photosynthesize. These chemical reactions speed up with temperature rise. The masses of ocean = 1.4 E21 kg and atmosphere = 5.1 E18 kg. Therefore, if ALL the CO2 in the atmosphere were to be instantly sucked into the ocean (and evenly mixed), it would result in an increase in the concentration of CO2 in seawater of about 1.5 ppm. How can this represent a threat of acidification of the ocean ?? See the largest quantitative analysis conducted on the subject of ocean acidification. Here- http://www.co2science.org/data/acidification/acidification.php & follow the links. One also has to wonder how they could measure the pH of the ocean to 3 decimal places in 1751…. The Great Barrier Reef is a 20,000 yr old, 2,300km-long ecosystem, so one end is in warmer waters with a lower pH and the other in colder water with higher pH…….both ends seem to be doing just fine. Carbon dioxide enters the waters of the ocean by simple diffusion. the carbon dioxide can remain as a gas or, if dissolved in seawater, can be converted into carbonate (CO3-2) or bicarbonate (HCO3-). H2CO3 ? H+ + HCO3– This reaction buffers seawater against large changes in pH. …and since CO2 also makes the buffer….there will be a long wait. The details they ignore is that CO2 and water can be turned into sugar by photosynthesis, while chloride can’t be used that way;… what is more, it’s toxic.…( hydrochloric acid is used as toilet cleaner) … More junk pseudo science. There is no such thing as ‘Ocean Acidification’. It is an absurdity, that can’t happen in theory, models or in reality. It hasn’t been measured, it can’t be measured and in terms of real measurement it is a phantom. Short lasting local areas of reduced pH (for a variety of reasons) YES….Ocean Acidification NO.